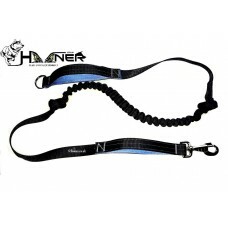 The Original Bungee lead from Hooner. 5ft Lead lead with integral marine grade bungee, D ring handler end for attaching to a belt using a carabiner. Traffic control handle for when you need your dog to be closer to you. Main lead is black with a choice of handle colours please select from the list. Heavy duty nickle clips and 2.5 Ton break strain tested tubular webbing making this one of the strongest leads on the market.